Taj Ruler is an actor, improviser, voice over artist, and teacher in the Twin Cities. She graduated from Pitzer College with her Bachelor of Arts Degree in Theatre Performance and Media Studies. Taj has been on a journey with her health after receiving a diagnosis of Ulcerative Colitis in 2014–for those that don’t know, Ulcerative Colitis, otherwise known as U.C., is the painful ulceration and inflammation of the colon, AKA the large intestine. U.C. comes along with gnarly symptoms such as major and increased urgency, diarrhea, bloody stools and more. Not fun! Taj has had to advocate to reclaim her health, and a big base of this has been discovering the Specific Carbohydrate Diet, otherwise known as SCD. 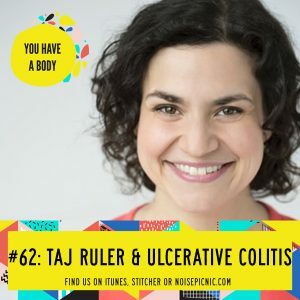 Listen on to hear how Taj has navigated Ulcerative Colitis over the years and how she’s able to love food again–instead of finding it an enemy! Taj also speaks to the power of the stress response and how finding a less stressful style of eating has not only allowed her body to heal, but it’s been able to provide her relief from feeling like she always needed to escape thinking about food and her body. This is powerful stuff, friends. Like what you’re hearing? Great! Leave us a review in iTunes and we’ll send a personal shout out on an upcoming episode to you! Check out Taj at Taj Ruler! Find Taj at the Brave New Workshop in Minneapolis, too.